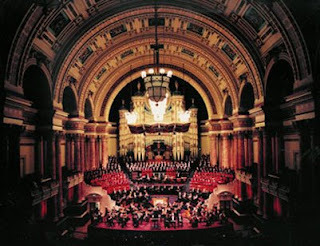 Back in Leeds from the Yorkshire Moors and on to the performance of Frederick Delius' "A Mass of Life" performed by the Leeds Philharmonic and Leeds Festival Choruses, the BBC Philharmonic Orchestra, and four soloists at Leeds Town Hall. The picture above shows the group and the hall in all their splendor. The ladies wore red and the men black tie. DP was the best-looking gray-haired man in the chorus, quite elegant in his formal suit. He's in the second row of the chorus near the center, a little to the left. What? You can't make him out? Well, that's too bad, because he looked quite handsome. I'd never heard this work before, but it is splendid, and all performed beautifully. If you won't take my word for it, you can read a review by a real music critic in the Wharfedale & Airdale Observer. The hall itself is a sight to behold, and the singers and orchestra in their contrasting red and black - well you can see for yourself in the picture that it was a colorful feast for the eyes. Now comes confession time. I was about five minutes late for the concert, and the group started RIGHT ON TIME! In New Orleans and even at the Metropolitan Opera in New York, performances almost never start promptly, but this one did, and because of my habitual tardiness, I had the misfortune of not being allowed in, and I had to listen to the first part of the piece on TV in a room on the side of the main hall. Of course, I would not have wanted to go in and make a disturbance, even if I had been allowed. That's the bad news. The good news is that the performance after the intermission or interval, as they say "over there", was longer than the first part. In the hall, all was grand and glorious sound. Hearing the music on TV was not at all the same. I hoped to sneak into my seat without DP ever knowing that I didn't get into the hall for the first part of the concert, but I ran right smack into him and was caught out in my delinquency. He was quite the gentleman about it. How could he not be looking so handsome in his formal clothes? After the concert, we headed to DP's favorite pub to meet his friends. We had our drinks and chatted. I told the group that I had met DP on an online dating service. I hope his bishop doesn't read my blog, because he could start off on the wrong foot in his ministry before he even starts his ministry. Calling the work a "Mass" is a broad use of the term, because the text is taken from Nietzsche's Thus Spake Zarathustra, which is in no sense Christian. I asked DP if the pope knew about this. He said that some church authorities will not permit the work to be performed in a church building. DP gave me the program for the concert as a souvenir. Inside is the entire text of the piece with German on one side of the page and English on the other. The English translation is hilarious. It was obviously done by someone with little command of the English language. I wanted to show it to our blog friend Erika while she was in Leeds. She does English-German and German-English translations and would have thought it a hoot. Unfortunately, I forgot. Altogether a lovely evening, even if I didn't get to hear the first part of the "Mass" from the hall. See. I'm still playing Pollyanna's "Glad Game". So I did hear someone say "Delius"... Was it in the Tiled Hall Café? I didn't quite believe it, because I know he is not well known. Good music though! Fredrick Delius was quite interested in Nordic Languages, BTW. The downside to reading your travel tales is, I'm getting a bit envious! Göran, you heard it either in the Tiled Hall Café or in the restaurant in the evening. It was a lovely piece and an outstanding performance. Sara, I'm making myself envious. I want to go back. In truth, I could not have kept up the pace for much longer. It would have killed me. We wondered how you managed to keep up the pace! When we suggested, after nothing more strenuous than a coffee shop, lunch and a stroll through Leeds, that we could do with a break before the evening, you almost looked shocked at our despicable weakness! Sorry I missed seeing the text, I had promised to remind you and forgot!! Erika, when I'm traveling, the adrenalin flows. I want to do it all, see it all, but eventually I would collapse if I kept that pace. It was good that you suggested a rest. The previous Sunday, the day when my cold was the worst, DP and Mrs DP gave me a quiet afternoon at their house. On another day, Mrs. DP kindly drove me to visit an old woolen mill, have lunch, and shop a little in stores that sold vintage clothes and jewelry. I was back at the hotel by the afternoon. It was pretty good from where I was sitting too. I could see Mimi in the audience: I thought she was singing along. She held up a big banner saying Doorman-Priest is wonderful. She is right, of course. I cannot see the picture! I envy you your trip Mimi. DP sounds such a fine man, well we all know that already. I would love to hear him sing! Oh, it showed up when I clicked on the question mark in the middle. Right! You can't see him, ha. But we've all seen him before... and his tattoo! Susan, I showed DP my tattoo, but I forgot that he had one, and he did not voluntarily show his to me. DP and his family are great.